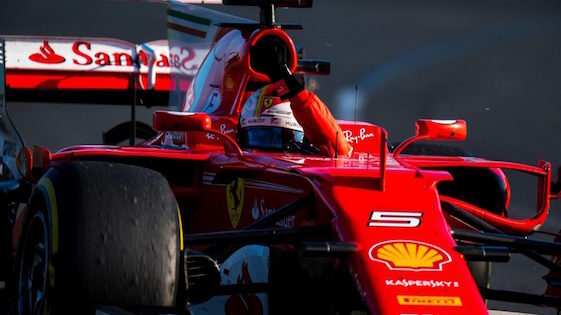 There is joy in Maranello and all over Italy today as a Ferrari has won the “Grandest Grand Prix” for the first time in 16 years. Sebastian Vettel took the lead from Ferrari teammate Kimi Raikkonen during a pit stop on Lap 39 of the 78-lap Grand Prix of Monaco and easily cruised en route to getting the victory. “Unbelievable,” Vettel, who started P2, said. “Very intense race. The victory was the first on the streets of Monaco for four-time F1 champion Vettel since 2011 when he was driving for Red Bull. It was the first for a blood red Ferrari since Michael Schumacher celebrated in Monaco in 2001. Raikkonen, who started from the pole and led until pit stops, finished second. The 1-2 finish moved Ferrari ahead of Mercedes AMG in the constructors’ standings – 196 to 179. Daniel Ricciardo of Red Bull finished third despite clipping the Armco barrier 10 laps from the end. “I’m happy today for sure,” Ricciardo said. Valtteri Bottas finished fourth on a down day on the Mediterranean for Mercedes AMG. His teammate, defending F1 champion Lewis Hamilton, started 13th and finished seventh. Rounding out the top five was Max Verstappen of Red Bull. There is probably a bit of joy in Charlotte, N.C. as well today as both America-based Haas F1 drivers finished in the points for the first time in team history. Romain Grosjean finished seventh while Haas teammate Kevin Magnussen, who suffered a punctured tire, was 10th. Raikkonen was not happy about how things transpired during the race-deciding pit stops. The native of Finland was called into the pits before his teammate. With Raikkonen in the pits, Vettel was able to use the clean air of being the front runner to make up enough time to keep the lead during his stop.